CRAZY LIKE A FOXY REPUBLICAN? Brian Beutler is asking why the National Republican Senate Committee would simultaneously run ads attacking and praising newly-minted Democrat Arlen Specter (to get re-elected, Specter would likely first have to overcome a challenge from the left in the Democratic primary, then beat Pat Toomey in the general election). Yesterday, our Pennsylvania Congressman Joe Sestak voted for President Obama’s budget, which contains spending increases for Democratic priorities like housing and environmental protection. But don’t Pennsylvanians deserve an independent voice in Congress? 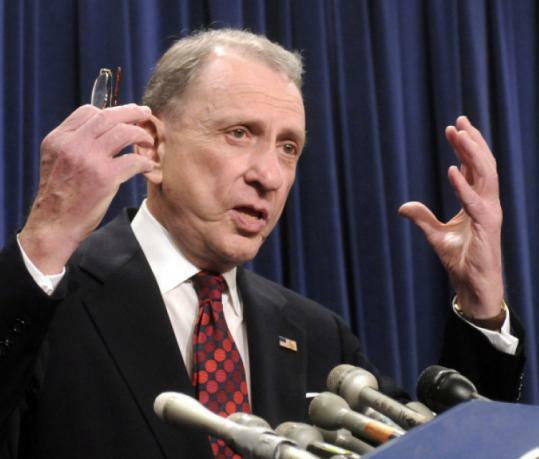 Our new democratic Senator Arlen Specter has been that voice. Last night, Senator Specter stood with conservative Senate Republicans in opposing the Obama budget. So call Joe Sestak at 610-892-8623. Tell Joe Sestak that Pennsylvanians want an independent voice, not another vote for the Obama agenda. If I’m a Democratic primary voter (and I am), all of this will just make me more inclined towards Sestak, and less towards Specter. And the fact that the GOP is ostensibly vouching for Specter will just make me distrust him that much more. Which is exactly the point: Hurt Specter’s standing with Democratic base voters so that Joe Sestak emerges as the nominee (and more power to them). If the NRSC were really trying to make Sestak less popular, wouldn’t they slap him with terms like “big government” or “energy tax” or “taxes for tuition benefits for illegal immigrants who come here to study abortion”? Do they really think “environmental protection” is a turn-off for Democratic primary voters and opposing Obama is a turn-on? They may be tone deaf, but not that tone deaf. This entry was tagged Arlen Specter, Brian Beutler, Democrats, GOP, Joe Sestak. Bookmark the permalink. ← EASIER THAN IT LOOKS?